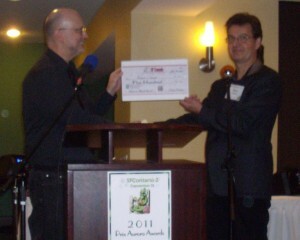 The 31st annual Canvention was held on November 20, 2011 at SFContario 2 in Toronto, Ontario, where Aurora Awards were presented in nine categories as voted by Canadian fans of speculative fiction. The 2011 Aurora Award for Best Novel in English went to Robert J. Sawyer for his novel Watch, along with the SF Canada Award of $500 which is presented annually in support of the Aurora and Aurora/Boréal Awards to recognize excellence in speculative literature in both Canadian languages. Robert J. Sawyer has a long history of success as an author, including American Nebula Award, Worldcon Hugo Award, John W. Campbell Memorial Award, Japanese Seiun Award, Chinese Galaxy Award, and multiple Canadian Aurora Awards. A ceremonial cheque was presented by the President of SF Canada, Steve Stanton.